With the holiday season approaching, I wanted to provide a list of gift ideas for the people in your life who love mini pigs (and not-so-mini pigs). Some items in this list of gift ideas apply specifically to mini pig owners, but most of the items work for anyone who loves mini pigs, whether they have a mini pig, want one someday, or simply think mini pigs are cute. I divided the list up into two sections: gifts for mini pig owners and gifts for anyone who loves mini pigs, so scroll down if you’re looking for more general gifts for that mini pig lover in your life. 1) Ball Pit: A ball pit is a great gift for a new mini pig owner. Ball pits or indoor rooting boxes give mini pigs a fun and appropriate place to root indoors, which is especially helpful during the winter when pigs can’t be outside rooting around. Something to consider is that a ball pit takes up some space and isn’t the most attractive piece of home decor, but it’s a great gift for someone who is looking to keep a mini pig entertained, has some extra space, and doesn’t mind having a ball pit in the house. A ball pit costs approximately $30 depending on which products you choose. To give a mini pig ball pit as a gift, you just need a plastic pool large enough for the pig and a set of about 100 plastic ball-pit balls. Ball-Pit Balls: The link below is for Amazon, but I’ve also found similar products in-store at Toys ‘R Us and Wal-Mart. 2) Blankets: Mini pigs love blankets! Blankets are a great gift idea for any mini pig owner, but they are especially helpful for owners with young piglets. When we first brought Oscar home, we were constantly washing blankets so that he had fresh, clean ones available. Having extra blankets to rotate was really helpful. If you’re looking for a safe and easy-to-find gift for a new mini pig owner, I highly recommend blankets. They’re not the most glamorous gift, but they will be used and appreciated. When picking a blanket for a mini pig, definitely check and make sure it’s machine washable for easy cleaning. Almost any fluffy blanket will do, but sherpa blankets are a great option since pigs can root around in them. I haven’t tried the exact blanket below, but it’s an example of one that works well for mini pigs and comes in a variety of colors. 3) Play Pen: This is a more practical gift, but it’s also a great option for someone with a new mini piglet. I recommend play pens for new mini pig owners because they allow the piglet to be in the same room as their family while still being contained, which is useful while the pig is being potty trained. This gift won’t work for everyone, but if you know someone with a new piglet who is struggling to find a great spot in their house to keep their piglet contained but still near the family, this play pen is an excellent option. 4) Snort Life Gift Card: Snort Life is an online store I mentioned in my post about mini pig clothes. Snort Life has a great selection of mini pig clothes and accessories with excellent reviews on Etsy. Most of the mini pig clothing options require measurements, which is an option if you have a sneaky way to get a pig’s measurements before ordering. If not, there are accessory options like bow ties, hats, and scarves that require less precise sizing. If you’re unsure of any measurements but know a mini pig owner who loves mini pig clothing and accessories, Snort Life offers gift cards so the owner can measure and pick their own gift. Click here to visit Snort Life’s Etsy store. 5) Treats for Mini Pigs: An easy gift option for a mini pig owner is treats for their pig. Pigs love food, so it’s hard to go wrong with snacks. One of Oscar’s favorite treats and a great gift idea is freeze-dried peas. We stumbled upon these when Oscar was just a piglet; he loves the taste and I love that they’re handy and healthy. A more extravagant treat option is a fruit or veggie gift basket for the mini pig. Most mini pigs love fresh fruits and veggies, so a fruit basket or even a fruit-of-the-month club would be a fun gift. 1) American Mini Pig Association (AMPA) 2016 Calendar: I’m a little biased on this gift idea because Oscar’s picture is in the 2016 AMPA calendar for January and July. The AMPA is a great organization committed to educating and advocating for miniature pigs, and all proceeds from the calendar are split between American Mini Pig Rescue and American Mini Pig Education. For the calendar, more than 600 mini pig photos were sent in and then finalists were voted on by the public. 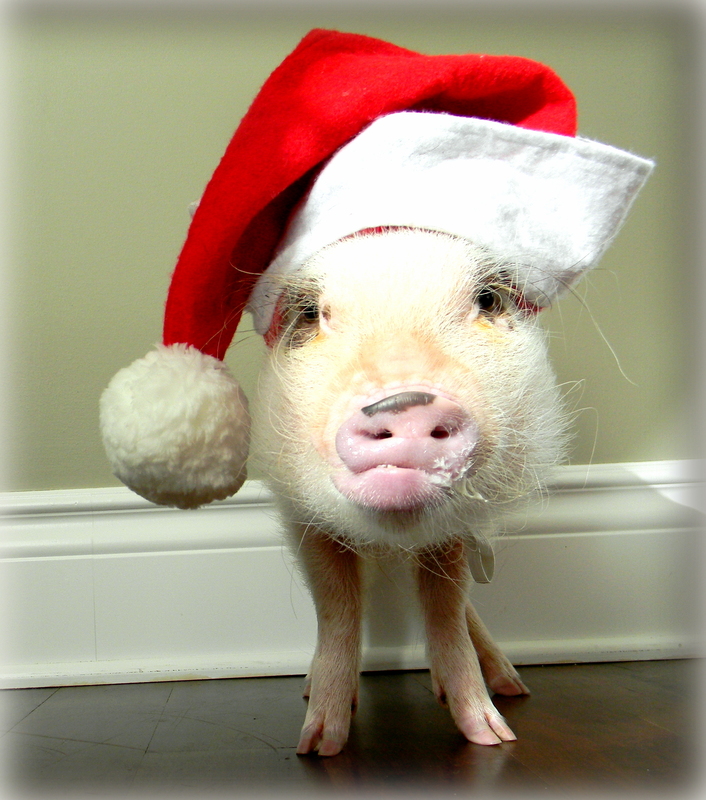 Each month features a mini pig photo contest winner, along with mini pig facts on each page. 2) Other Mini Pig Calendars for 2016: In addition to the 2016 American Mini Pig Association calendar, there are tons of other great calendars for mini pig lovers. Prissy and Pop have a 2016 calendar out, as does Esther the Wonder Pig. There are also a number of adorable mini pig calendars available on Amazon, including the Pocket Pigs mini and full-size wall calendars. 3) Prissy and Pop Mini Pig Stuffed Animal Plush Dolls: Priscilla and Poppleton, also known as Prissy and Pop, are two of the cutest mini pigs on the Internet. Oscar and I look forward to checking their Facebook page “Priscilla the Mini Pig” every day. This year Gund made Prissy and Pop plush toys available for sale, and they are adorable. These plush toys are a great idea for any mini pig lover, but they would make an amazing gift for kids who love mini pigs. 4) Oink: My Life with Mini Pigs book by Matt Whyman: This is a book I read several years ago when I wanted a mini pig but wasn’t ready for one yet. It’s a non-fiction story about a couple who adds two mini pigs to their home, which also includes a dog, cat, chickens, and four children. It’s an entertaining story about the misadventures of their two new pet mini piglets. It’s not meant to be instructional or super informative about life with mini pigs, but it’s fun and endearing and recommended for anyone who enjoys both reading and mini pigs. 5) Kohler’s Pig Art Print Poster by Michael Sowa: I first discovered this picture of a pig diving into a lake when I was browsing at Kirkland’s a few months ago, and I fell in love with it. Since then, a few other mini pig owners on social media have posted it and mentioned how much they love it as well. Art is a tricky gift since it depends on knowing someone’s decorating style, but this is a great gift for many mini pig owners. This picture can be found several places online, so do a quick search for “Kohler’s Pig” to find the size and framing options you prefer if you’re interested in purchasing it. 6) Pandora Pig Charms: I received a Pandora pig charm as a gift earlier this year, and I love it. Pandora currently has two pig charms available, one called “piggy” and one called “playful pig.” They are very different styles of pigs, but both are great and just depend on the personality of the person receiving the gift. The Pandora charms require a Pandora charm bracelet in order to wear them, so make sure the person you are buying for already has a Pandora charm bracelet or you will want to include one as part of your gift. If you buy the bracelet and charm together, this gift can be more expensive but is a great option for someone who love mini pigs and jewelry. Click here to see the Pandora “piggy” and “playful pig” charms. 7) Donate to the person’s favorite pig rescue or sanctuary: Many pig owners are involved in outreach for farm pigs and other farm animals. If the person you are buying for is passionate about helping and supporting animal sanctuaries, donating to their favorite pig rescue or sanctuary is an excellent gift option. This can be a really meaningful gift and shows support for the things your loved one cares about. You can ask the person what their favorite rescues or sanctuaries are, or you can be more sneaky and see if they “like” or discuss any particular rescues or sanctuaries online on social media. 8) Farm Sanctuary’s Adopt a Farm Animal Program: Farm Sanctuary is a well-known and respected animal sanctuary, and they offer a donation program with a more personal touch. Farm Sanctuary’s Adopt a Farm Animal Program allows you to choose a type of animal and make a year-long commitment to an animal through monthly, quarterly, or annual payments. In return, you receive an adoption certificate with a color photograph of the adopted animal and different adoption benefits depending on the animal you choose. The program is more of a commitment than a single donation, but it’s a great option for someone who is passionate about helping farm animals. Hopefully this list helps with gift ideas for the mini pig lover in your life. As I think of more gift ideas, I will add them to the list.